[FONT=Arial]A rumination on the psychological wounds created upon the victims of violence and of the bravery it takes them to come to one?s senses, Eureka is one of the best films in recent memory. In an era in which filmmakers seem more concerned with box-office grosses and self-indulgent materialism, Eureka proves exceedingly unique, in many ways. Surely a film that is 217 minutes long is not really aimed at a mainstream audience? But most certainly its subject matter will put most people off, given that the film is about people. Nowadays we have ? lamentably ? got used to watching films whose main purpose is to entertain the audience with innumerable explosions and visual effects running amok. Nonetheless, director Shinji Aoyama treats cinema more as an art form, and Eureka is clearly a manifestation of that. Eureka runs ? or should I say, slides ? at a snail?s pace, but not for its own detriment. There have been critics who have criticised it because of its pace; needless to say, their arguments for the film could not have been more thoughtless. This is a film both engrossing and captivating, poetic and contemplative; a film that simply wants us to see and to feel, while bewitching us in its own aura. At the start of the film, we see a bus get hijacked in a small Japanese town. There is no reason, motive or justification; it just happens, and Aoyama portrays it like the people there would have seen it. The passengers are as bewildered as we are: no explanation is given and it occurs all of a sudden. Only three people survive: the guilt-ridden driver Makoto [Koji Yakusho, in a superlative performance] and young brother and sister, Kozue and Naoki [real life siblings Yoshiko and Aoi Miyazaki]. Some years later and they still are struggling to re-engage with life. Kozue and Naoki now live on their own; their father was killed on a drunk-driving night and their mother fled for some mysterious reason. Traumatised by the past event and still trying to cope with the sadness that life has brought them, they have ceased speaking to each other or anyone around them. But when Makoto abruptly buys a bus, and sets off with Kozue and Naoki on a long journey across Japan, they embark on a liberating odyssey of internal self-discovery. It is true that Alfred Hitchcock once said, "The length of a film should be directly related to the endurance of the human bladder." 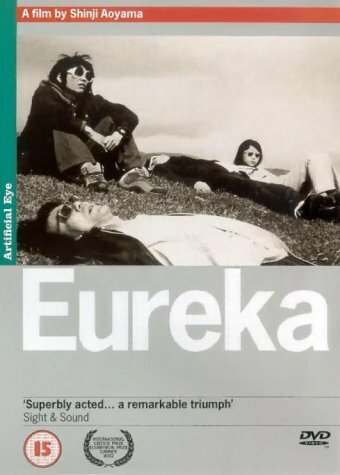 Quite clearly, Aoyama either did not bear this in mind or simply ignored it; Eureka is an epic of gargantuan length, a film that, in the spirit of Antonioni?s films, somehow bears a resemblance to his masterpiece L?Avventura. Because while both films are mainly about the human psyche and its disconnection from life, they also deal with what it takes to rebuild a life and the mourning and sense of loss that one has to go through. Eureka is a masterful psychological fable, whose main foundations are the souls of the people it deals with. Its languorous pace is deliberate and yet enchanting; Aoyama tends to employ various unedited shots that, though not as long as those of Bela Tarr?s in films such as Damnation, serve to further immerse us into the film. At the end, because of the film?s pace and because of Aoyama?s sheer brilliance, we feel as though we had really formed part of their journey. We all feel as though we had been there, for a moment at least, and that our knowledge ? or lack thereof ? of the characters is as accentuated as theirs. Midway through the film, one suddenly realises that ?nothing much? has happened yet; thus one wonders where the film is taking us. Aoyama takes time in delicately developing his characters to the point that we all know them inside out; we just know what they?re feeling by merely looking at them ? though the ?why? is not always there. That said, Eureka is a film that plays like a slow melody and even so it seldom builds up to a crescendo. There is little suspense in the film and it plays in a very linear fashion. Aoyama doesn?t waste celluloid in showing us flashbacks of the bus hijacking or anything of the sort ? he just moves the story, however gradually. Despite its sheer enormity and whatnot the film is at its core a very simple story, concentrated on the necessary things to tell and on the authenticity of the characters and the circumstances they find themselves in. Dialogue in Eureka is rather sparse, too, and yet we are able to see through the characters? facades and feel what they?re feeling at such moments. Makoto, Kozue and Naoki are all given a second chance. They once thought they?d lost it all as an aftermath of the hijack, but they were wrong. As hard as though it may seem, the time has come for them to make amends with themselves and to find out who they really are. Filmed in a beautiful sepia colour, Eureka has a distinct look to it which indicates the washing away of the people?s lives, the past which has now somewhat discoloured their existence and taken the happiness out of them. There are shots of supreme beauty in the film that will probably linger in your mind long after the credits have rolled; it is Aoyama?s insistence on amazing us with the beauty of such images that proves to be one of the finest elements of the film. For example, shots of a floating shoe on a lake or of the two siblings going out for a ride on a bike are, simply put, mesmerising. After the film, one can?t forget the undulating curtains, the quiet images of nature and the eternal silences of the grief-stricken trio. The camera tends to, more often than not, place itself a bit away from the characters, thus enhancing that sense of distance between them and us ? but that does not prevent us from relating to them. The score integrates seamlessly with the images induced, and one can?t help but marvel at the pure poignancy and loveliness that is transmitted in such scenes. Yeah, excellent film- a pity attention spans these days are often too short to appreciate it. I think comparisons with Antonioni are apt, and i was reminded of Ford and Wenders' Kings of the Road too. Still, i thought the major revelation, linked to the murder mystery, towards the end detracted a little from the overall effect (seemed more sensational somehow than the rest of the film), but i suppose it fitted with the general idea of the long-term hidden psychological damage an event like a hijacking can have.